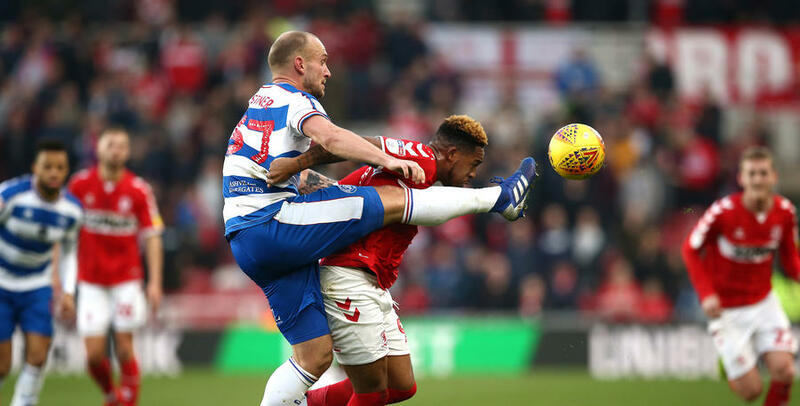 QUEENS Park Rangers have come away from Middlesbrough empty-handed after a 2-0 loss at the Riverside Stadium on Saturday afternoon. First-half goals from Jonny Howson and Ashley Fletcher sealed what was a comfortable win for Boro, leaving the R’s still searching for their first league win of 2019. After what has been a jam-packed month of fixtures, Steve McClaren made four changes to the side that took to the field in Tuesday’s 3-2 loss against West Bromwich Albion. Grant Hall, Ebere Eze, Ryan Manning and Tomer Hemed all came into the side, while the R’s would have to do without midfielder Luke Freeman who missed out on the trip with a hip flexor issue. Tony Pulis made one change from the 11 that beat Blackburn 1-0 win last week, as captain Daniel Ayala returned to the side following his one-game suspension. The game had barely settled when the home side took the lead in just the second minute as Howson latched onto Mo Besic’s ball in behind the defence before finishing past Joe Lumley. Rangers looked for a quick reply and had their first sight on goal a few minutes later when Ebere Eze drove into the box and got a shot away but Darren Randolph was able to parry the ball out for a corner. In what was an open start to the match, Besic nearly doubled Boro’s advantage after 15 minutes when he let fly from the edge of the box after a darting run through midfield though his shot flashed just wide of Lumley’s post. Middlesbrough did get their second after 31 minutes when Fletcher capped off a counter-attacking move by blasting home off the crossbar from a tight angle. The home side nearly had a third just seconds later when Britt Assombalonga pickpocketed Toni Leistner and raced through on goal but Lumley was out well to deny the striker. Now needing to chase the game, Rangers began to see more and more of the ball as the half came to a close but Boro would head into the break with their two-goal advantage in tact. QPR started the second-half on the front foot and minutes after the restart had a look-in on goal when half-time substitute Bright Osayi-Samuel cut in from the left-hand side but the youngster dragged his shot wide from a narrow angle. Boro seemed content to sit on their lead and break on the counter and did so when George Saville dribbled through midfield and got a shot off from 25-yards out but his effort went just over the crossbar. The home side should have had a third after 75 minutes when Assombalonga was teed up in the box with the goal at his mercy but Lumley made himself big and was able to block the shot. Substitute Nahki Wells had a great chance to pull one back for the R’s with five minutes left when he found himself through on goal but he was unable to squeeze his low finish past Randolph. That would prove to be the last chance of the match as the game finished 2-0 in favour of the home side. The R’s will now switch their focus to Tuesday night when they’ll take on Leeds United at Loftus Road.